To celebrate 10 years in the game (congratulations Matt! 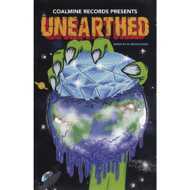 ), Brooklyn based indie label Coalmine Records has released their Unearthed compilation. A 2dope collection of tracks featuring the likes of Pharoahe Monch, Blu, Sean Price, Skillz, Royce Da 5'9", Guilty Simpson, Torae and countless others. Seriously, this project is stacked.